What is a piadina? 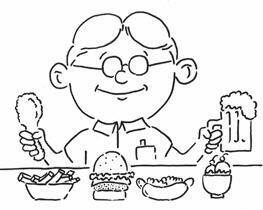 The easy answer is that it's a sandwich, since it technically has a bread-like substance "sandwiching" meat, cheese and veg. But then, it's just as easy to say that it's anything but a sandwich, since it can taste like a cross between a pizza, a calzone, a wrap, a burrito, a quesadilla, and a Chinese-style beef roll, all at the same time. So I'll just tell you what happens when you order one. A ball of dough is compressed into a thin disc in a gigantic vice, the same kind of contraption you've probably seen at most of those new make-your-own-pizza joints of late. Then the dough disc gets slapped onto an griddle where it toasts as though it were a tortilla. After it gets mottled with brown spots on both sides, the flatbread is transferred to the filling station. Since it's all one price, I choose the one that had the longest list of components. This would be the one called "Reggio", with "Prosciutto, Parmigiano-Reggiano, Mozzarella, Mushrooms, Arugula, Tomato, Tartar Sauce, and Tabasco." But ultimately, it wasn't the fillings that mattered; it's that flatbread. It crackled crisply like the best Chinese onion pancake, but sans all the grease and thinner by half. And it remained crispy from my first bite to my last--this despite the smears of sauce, the moisture from the mushrooms, and the two kinds melting cheese. So what is a piadina, really? It's delicious--one of the best sandwiches/non-sandwiches I've eaten in a while. Monster Munching: Now On Facebook! Just wanted to clarify that Monster Munching isn't going away (yet!). The blog, as you see it now, won't change. It's just that I've created a Facebook account that you can subscribe or like (or whatever it is that people do on Facebook). And when you do, it'll let you know when a new Monster Munching post (and my OC Weekly restaurant review) comes online! I've been doing this blog for more than a decade now. It has outlasted a lot of the restaurants I've reviewed for it. It has been around before Yelp became a verb. 2. Take the defibrillator paddles out for one last jolt. For now, I'm going with #2. But since trying to get more people to discover the blog requires SEO skills I don't have and money I don't wish to spend, I've come up with the next best thing: Facebook. Yes, this blog is now on Facebook. I'm not sure yet how well this will work out. But I'm told Facebook is where all the cool kids are. So if you're on Facebook, "Like Me"...(that's the first time I've typed those words and now I feel dirty), because at the very least, you'll see when I've put up a new review without having to check back here. Now, what's this about SnapTweets and TwitterGrams? 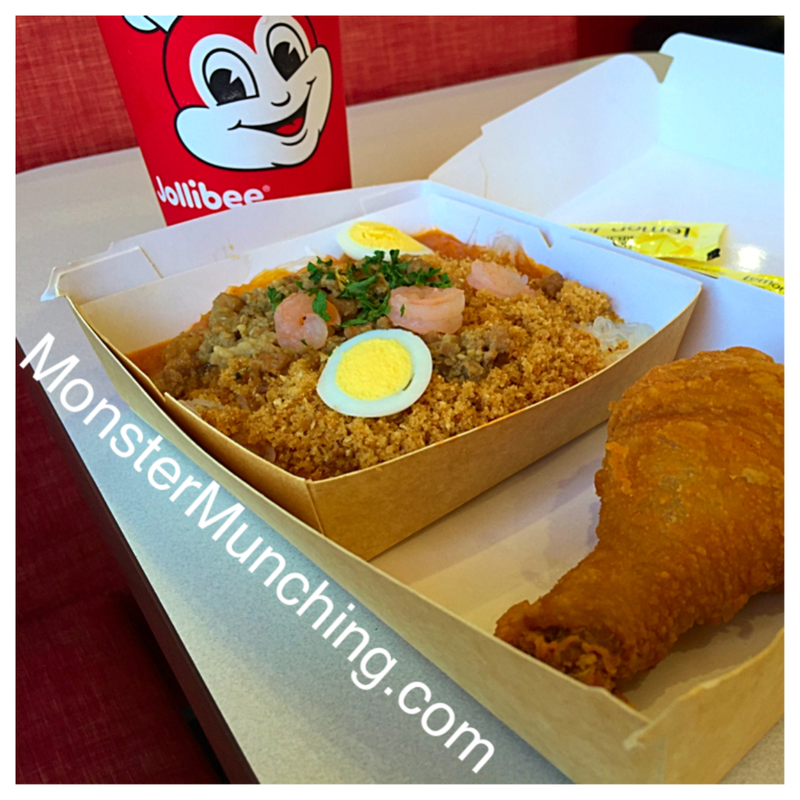 As a fast-food joint, Jollibee isn't immune to offering combos. The Filipino fried chicken peddler will sell you fries to go with the burgers, and then bundle in a big ol' soda to wash it all down. But the combo I like better is the one that combines their version of pancit palabok with a drumstick. It encapsulates what Jollibee represents in one tray--the harmonious dichotomy of Filipino and American fast food. On one side, rice noodles doused with garlic-y gravy and dusted with pulverized pork rinds. On the other, a battered deep-fried chicken leg that doesn't look much different from KFC's. After I squeezed three packets of lemon juice into it, I slurped the noodles--something I previously described as looking like pad thai, but tasting nothing like it. And then, I chomped into the chicken as a separate mouthful, steam plumes escaping from the fresh-off-the-fryer drumstick, the skin 'neath the batter rendered crisp. But when it settled, it didn't make me feel awful like the time I had a Western Bacon Cheeseburger Combo at Carl's, all this despite the fact that Jollibee still insists you chase it with a big ol' sugary soda. If you're a new ice cream entrepreneur these days, it's likely that the the words "liquid nitrogen" are in your business plan. That or "donuts". But so far the liquid nitrogen ice cream joints are outnumbering the ice-cream-stuffed-donut ones. 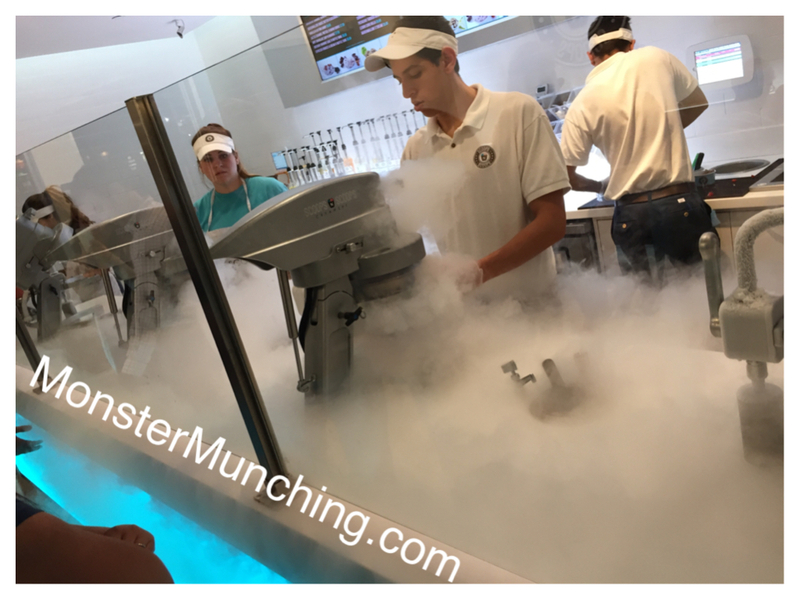 Liquid nitrogen ice cream is the new frozen yogurt. I've lost count on how many opened in the last few months alone. But if you've been to one, you'll notice, for the most part, they're all nearly the same. Heavy duty mixers are installed behind a see-through partition. Next to them are spigots connected to the LN tanks. When you order, you tell the cashier not just what flavor your want, but also what kind of milk. Scoops N Scoops offers four choices of your base: premium milk, coconut milk, yogurt, or organic milk. Then comes one flavor, and if you're feeling spendy: toppings and extras that could also include cotton candy. Whatever you order: you're in for a spectacle. The fog spills out from the mixing bowls and onto the floor as though a Rush concert just broke out in the middle of Irvine. But it's not all for show (though most of it is). The liquid nitrogen is supposed to freeze the ice cream so fast, no aeration occurs nor do ice crystals form. This purportedly results in a denser, smoother texture of ice cream. It's like a shortcut to Häagen-Dazs without all the churning. 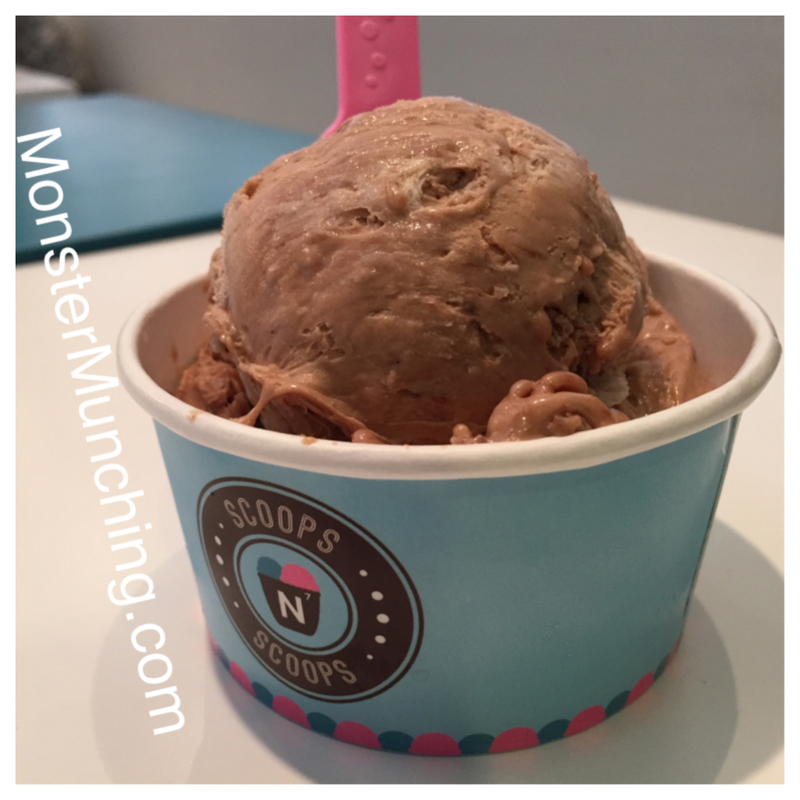 I tried a chocolate hazelnut on yogurt and it was indeed dense and smooth. A friend's strawberry ice cream with plain milk turned out best, tasting like super premium ice cream. And since they used actual fresh strawberries, it tasted like strawberry ice cream always should: perky. Another friend's coconut ice cream in which they seem to have pumped in a few squirts of coconut syrup, did not fare as well. It was so sweet, it rotted out teeth on contact. If you intend to try it: Be prepared to spend twice, if not three times, as much than you would for Thrifty's ice cream at Rite-Aid. But again, you're not coming just for dessert, you're there for dessert and a show.